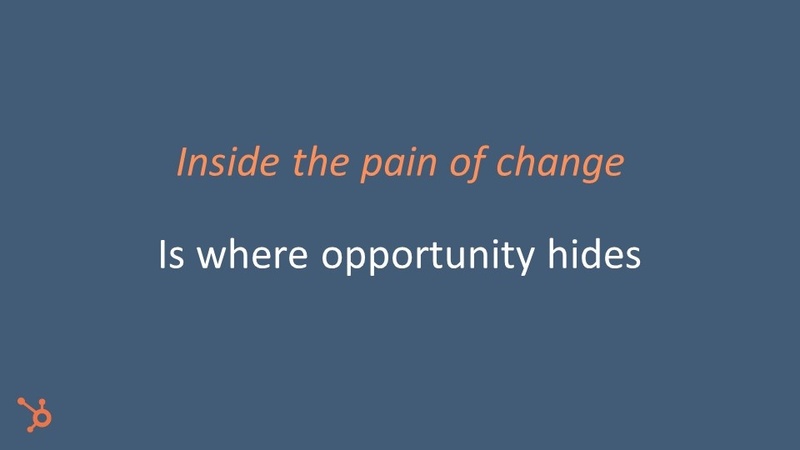 This is a transcript of the talk given by Stephen Higgins from HubSpot at the HubSpot User Group Meeting in September 2018 in London. So just a quick piece before I go into the service hub, just as I said, our partners here are obviously Vidyard. Sometimes we, in our professional lives actually come across something that's, you know, works really, really well for us or it has a massive impact on business. And I think it's only fair, I said, as HubSpot, being here to let you guys know like genuinely within my team, nothing has changed our prospecting more than what Vidyard has done. So me being an elderly millennial, I'm kind of poor at, you know, change I hate doing it and someone brings something to me, but my team started talking a huge amount about this video thing that we're doing for prospecting and whatnot and we were still in the, you know, I love the old playbook of cold calls and all these different things going on. To four x conversion increase would be an underestimation of what that's actually impacted for my team. So my team looks at everything across the Nordics, Benelux, Central and Eastern Europe and into Iberia. So Portugal, Spain, and it doesn't seem to matter what the region is. I just think it's important to acknowledge that when we see that kind of an opportunity to help you promote other businesses and to give you a real feedback on how that's actually changed the business. Like if it's one of the major things you do from today, get involved and look into HubSpot video or work with Vidyard directly guys because it will make a massive difference to your business genuinely because the opportunities that we saw as a result have been phenomenal. So make sure you take some action on that today. Okay. So cool. So to give you the good news. I'm going to be nice and quick for you today. So what I just want to do is give you a very simple run through of, first of all, service hub and why it exists in the first place and the elements of it. What I would recommend then, if some of this resonates with you today, that you set up a specific demo of the tool for yourselves. Okay. So I know Michael did a little bit of this already. So we have how many people here have HubSpot right now? Yeah. So low. That's great. How many people have service up? Very few. That's. Yep. So how many people have heard of it? Okay. So now. So we're very mixed. Okay. So for a lot of you guys, this will be the first time you've heard about it. For some of you and obviously it will be at something you're probably interested in finding more out about. So this is a product that I'm genuinely very passionate about. So my actual background is I come from marketing background and I initially got involved with HubSpot through signals by HubSpot . If any of you're old enough to remember that. And eventually the company I worked in and then working forward. So I'm a genuine advocate of the company I work for and the impacts that that product has had, not only on companies that I've worked for but on my own career and which has been fantastic. 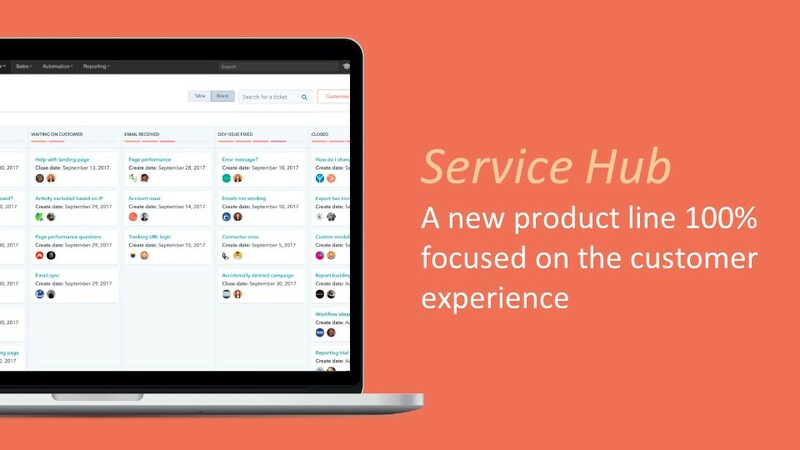 And to be honest with you, I haven't been more excited about a product as much as I have when we brought up service hub. And the great thing obviously is that we built it in Dublin, which is super, which is as being Irish, where I was super proud of everything that we build, titanic included. But this is better than the titanic hopefully. And it won't have any negative impacts on you. 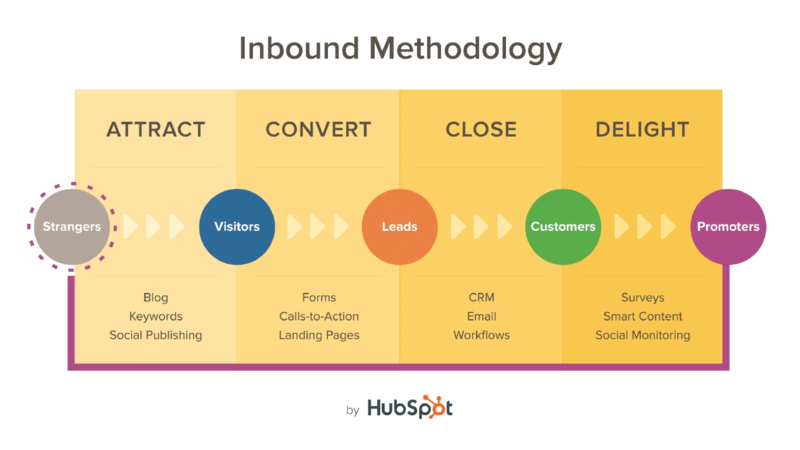 So what's important to remember is, and I suppose why inbound was created in the first place and the whole methodology around it, is that people have actually changed significantly. Okay. Particularly in the fact that we just lack patience in absolutely everything that we do . And me as an extremely impatient person has only become more impatient over time. 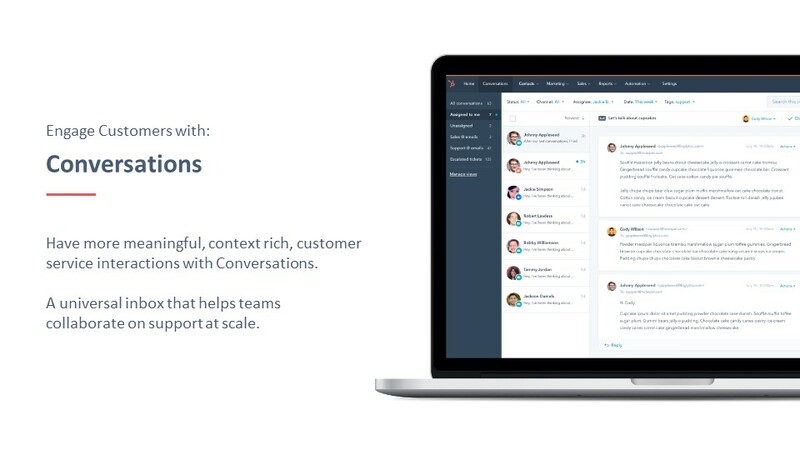 So when we think about the way that we used to interact with businesses, okay. We used to be a little bit patient so we'd, you know, we'd be happy enough to call support and you'd wait on hold and you'd have that horrible music and you'd go around the house and you'd talk to a second person and explain the same thing again and on and on we'd share information, we'd get rerouted We'd wait a little bit more, we'd reached our information, we'd get an answer,boom. Nobody says a whole lot about it because that's what we expected. Now because we're used to instant information and getting results quickly and also it's actually very easy for all of us now to be heard if something goes wrong or we don't like an experience. "We've become massively impatient and ,to be honest, hugely entitled about everything that we do." Earlier on this morning, in the hotel I was in, there was a lift in there, that in my mind was extremely slow. I went onto trip adviser and I was going to write about the slow lift. That is just ridiculous, but that's how impatient and entitled that we have become. So as a result of that, what will tend to happen from an actual perspective is everything we do starts online. Okay, but what we're going to do is start a chat. "We really don't want to talk to people. We want to be able to control our own environment." A call is an absolute last resort, like we've all gotten to the point now nearly where it's you're telling someone, Oh, did you? Did you follow up on that? Did you do this thing or did you check in with that company because you get x, y, and Z. I sent them a few emails and they go, did you call them? Sent them a few emails and we just refuse to pick up the phone in order to do this. As customers or prospects or all these different things. We kind of want this little bit of a digital relationship first and it's very important that we as businesses actually begin to acknowledge that, because you are actually hurting yourself, if we're not set up with a system that allows people to deal with us in a safer environment before they say, "Okay, I'll talk to that big ginger guy from HubSpot and he's not going to kill me.|. Okay. So we also find that people have obviously become a lot more sceptical too, and they actually lack a huge amount of trust ,into who it is they trust. So generally, formerly, when buying products we'd actually trust the salespeople. And I actually still see it with my mom and dad a lot today. They have, for instance, like they have this guy they go to with their car and they have this person, they buy x off and they just presume that this person is the greatest truth teller of all time. So I remember my dad, he'd go and he'd be in the market to buy a new car and, he couldn't believe it ,the guy always had the perfect car for him. It was incredible. He always had it. It was the best and don't mind the little thing on the back. It was always perfect. 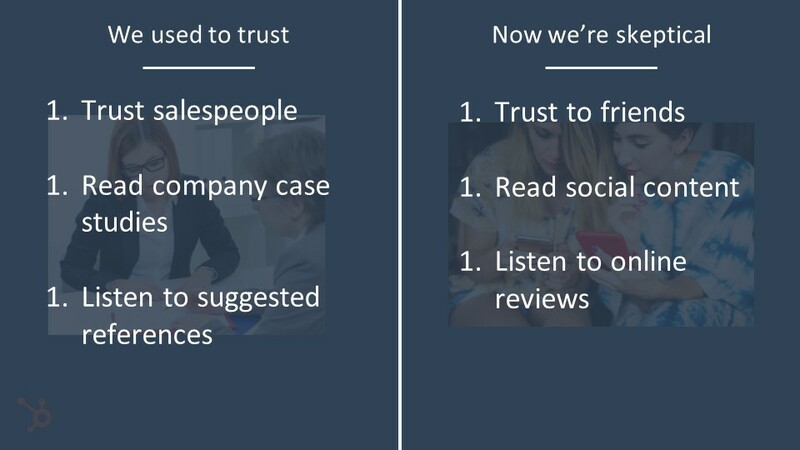 So we used to trust a lot of salespeople. That's where we get it from. We'd obviously go through case studies, different things like that, and we actually listened to, you know, suggested references. 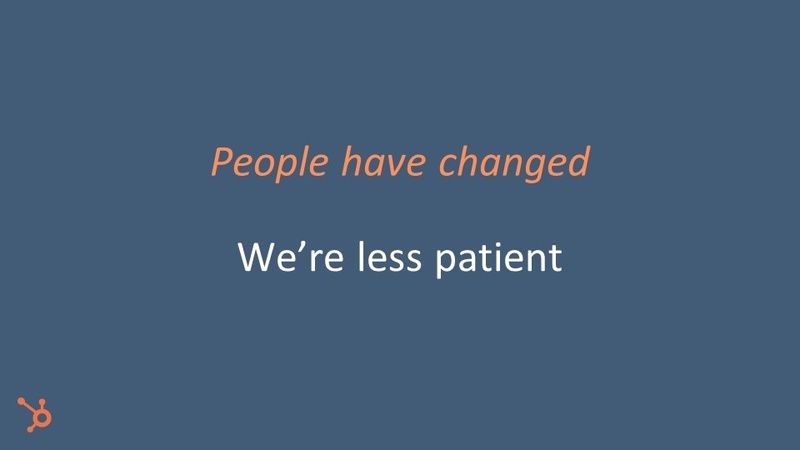 The reality is we're more trusting now in what our friends tell us, what people tell us online when we go and read social content about people's real actual experiences, lifts being quicker, faster, whatever the situation may be. And we also listen to a lot of online reviews. 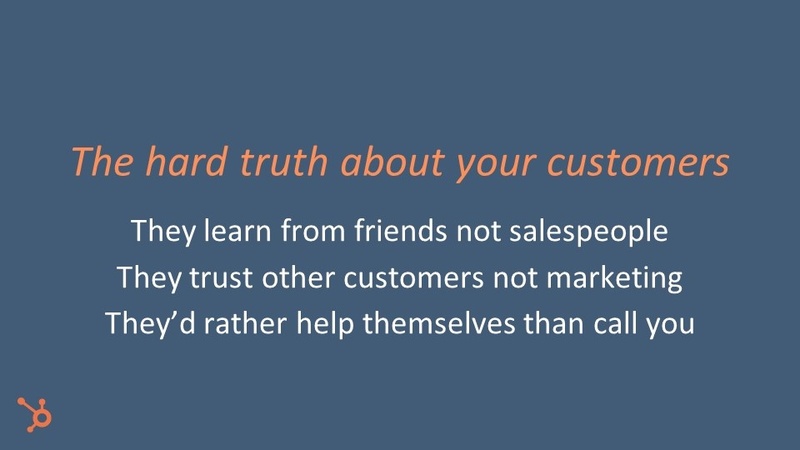 So I guess the hard truth about your customers is they learn from their friends and not salespeople anymore, they trust other customers more than marketing and they'd actually rather help themselves than to call you. And that is a very significant part of what we need to understand from today. Okay. Technology and all this different stuff apart, is that they'd actually rather help themselves than to call you. 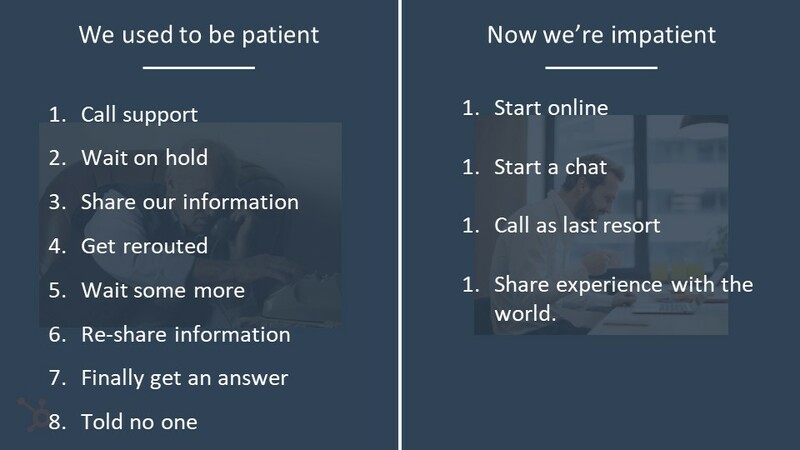 So when we begin to think about some of the little pieces of data to stick in your mind behind this is one to five minutes is what most people will wait ,on hold, before hanging up a call, okay? 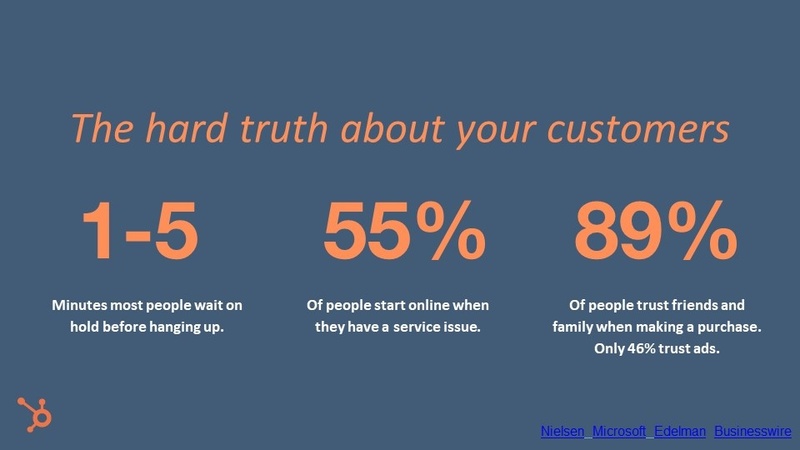 "Fifty five percent of people start online when they have a service issue." So whether you're an agency or you're working in customer services or you're B to C or B to B, most people actually just prefer "can I quickly find the answer to this thing online or not?". And they get a little bit frustrated that they have to call you up and talk to a person and find someone them gets them to call them back or send an email, do all these crazy things. They want to find that answer online. Okay? And you need to know what are the common issues that come up for your customers. "Eighty nine percent of people trust friends and family when making a purchase and only 46 percent trust ads." So the continued hard truth here is ,guys, is that they don't actually need you like they used to. Okay? So as important as we all think we are and we're all grown to be massively self-entitled and all these great things that the world has created, is that they don't actually need us like they used to, okay, we can actually set up their digital world for them ,that allows them to be serviced in a much better way. So we also must recognise that this is actually how it should be. So let's think about in here ,where the actual opportunity is then for us. So you guys are probably at this point sick to death of seeing these sort of things. Okay, where we talk about funnels are dead and fly wheels are in and all this kind of great stuff. So what I'm not going to do is going to spend a huge amount of time on this today. But to set the scene, this is how the world needs to look. And this isn't just HubSpot because we're a big company or Vidyard or one of these. Every single company should think exactly this way and what this is we look at here is if you take the flywheel piece out of it for a second, what this is is an operating system for your business and how it should function ,so it should ,one of the most important parts if. 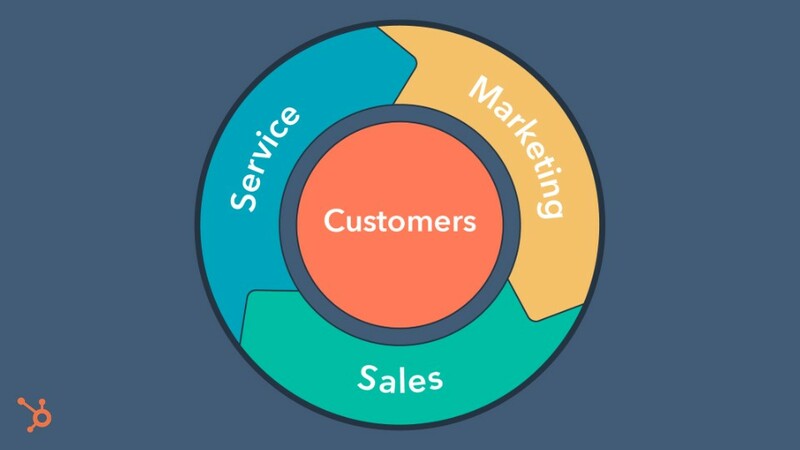 Yeah, if I was to take two segments out of that, there would be the customers at the centre and the service those customers get, because that's what feeds marketing and that's what feed sales. Okay. Because, as all businesses, we get most referrals stuff coming into us and we close and We get a few customers doing x, Y, and z. If those customers are happy and they get good service, that refers to good marketing and ends up with good sales. Okay. So we can keep this really simple if we want. And I think if I was to begin to prioritise and start back in marketing today, I'd actually start with how happy are customers, how are we servicing them? And I would actually begin to build my marketing playbook from there. So let's have a look at the actual service hub and how this piece of technology actually solves for it. 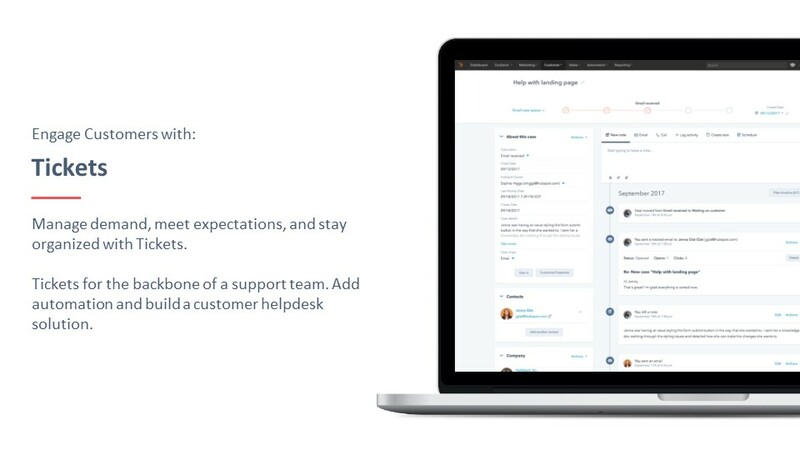 What I like about it guys is that it's actually really, really simple what we've set it up to do and it makes your life so much easier as you, the person who needs to go and execute on this, but also the customer themselves has a really, really good user experience. 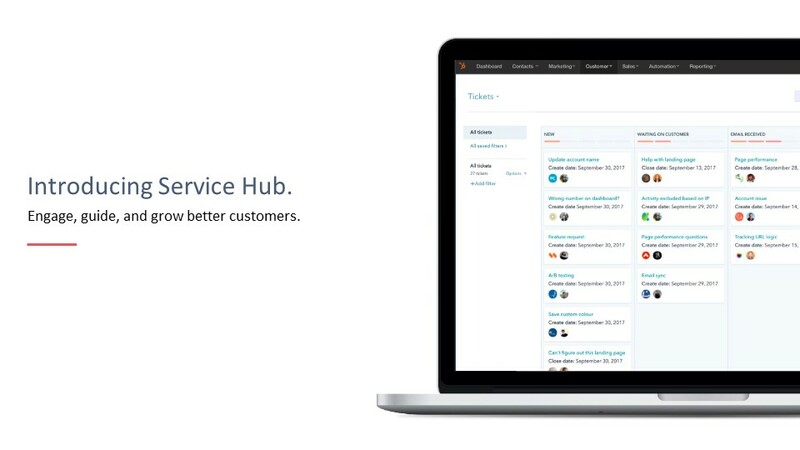 So let's have a quick look into service hub. This is my favourite too. Okay. My favourite child in the whole thing which is conversations, which is very simply live chat ,when you go onto the site. So a lot of people in this room, if you're in sales or indeed if you're in marketing, the thing that you're probably struggling with most days, opportunity creation, new business, all that thing coming in. So at some point in time you probably built a website and did a bit of work around it and maybe bought HubSpot to start to get some traffic to it and then all of those people, so let's pretend that this room is your website, all those people came into the room and they started having a look around at things and then you didn't talk to anyone. You didn't talk to any of them and imagine that you have a sales team sitting there and the room was full of all your potential prospects, so that could be tens a day, hundreds a day, thousands a day. I don't know what's going to your website, but the reality is there's people who want to buy who are looking for your services or your products today ,on your website and you're refusing to talk to them. You're literally turning your back on them. So the first thing that we want to be able to do is people who are coming to our website, let's talk to them in real time in open office hours or whatever you do. Let's have actual real conversations with them. That can be everything from prospects to people who are your actual customers right now, and it can be simple as every single person that hits the website, in my opinion, should be getting a message to say," Hey Stephen, how can I help? What are you looking for?" That's what I would recommend, if you want to see this in play ,I'd say get a demo setup of this and you'll see some really cool stuff in there, but what I'm kind of here today is to get us to understand the principle of what happens there. From a prospect perspective, we want to speak to the people that are walking around in your shop looking at your stuff. Just ask them what they want. You will create more opportunities by doing that, really simple stuff guys, and as importantly then, if we have our current customers coming to our website and to our digital content and they're walking around and they're looking in there for an answer, check in with them. "Stephen what are you looking for ,is everything okay?" That's such a better experience for somebody. 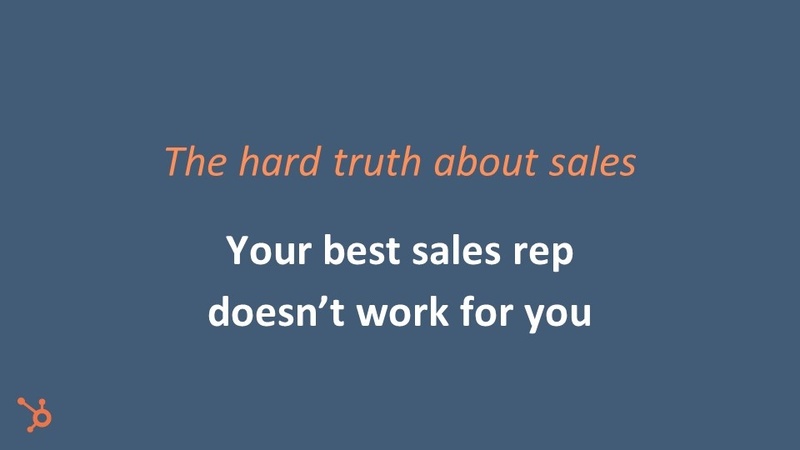 So for a lot of the sales teams that report to me in HubSpot, what I always tell them is that the best way to be good at sales is that you should be the best conversation that anyone has that day. Be The best conversation that somebody has that day and we can do the exact same thing here by creating the best experience that somebody has with your website today and that will change the way people think about your business, your customers talk about it and how they recommend it. And when we think about that flywheel, again, I came here, I wanted to buy something or I'm already a customer and I had this issue and this is how the guys helped me. I actually love dealing with them. I don't have to talk to anyone. That's great. That's how this works. That's how this whole piece comes together. So when we think about actionable things to do, for your business, say the number one thing I would recommend is get out and think about setting up a demo, specific to your business around these sort of pieces. Okay? So the second thing then is tickets. There's nothing worse ,in customer experiences we've all had, than a poorly managed complaint by you or an issue that you have or whatever it is. Okay, it goes into an inquiries or an issues inbox or you're calling somebody up or you're doing whatever and there's no ticketed system for your team to deal with. Did that person get that email? Did this person get that email or they're away on holidays and so on, so forth. Get a very simple piece of technology in there ,that allows you to manage your ticketing system. If somebody has an inquiry or if somebody has an issue related to your product or there's an ongoing case or something needs to be escalated, use technology to do that. Don't be like, it is stupid of us in this day and age, not to be leveraging technology to do this and like I always say about things that I'm genuinely passionate about, whether you do this with HubSpot or do it with someone else definitely do this, definitely put this in place and make sure that every single complaint or issue or inquiry, that comes from any of your customers or prospects is dealt with correctly and you're able to check that over time to ensure that what you're doing is creating a good customer service experience, which is going to feed your marketing in turn. The next thing then is knowledge base. So we looked already at the start to say the majority of people start online, okay, that's what they want to do. They have an issue with something and they want to find out how do I fix this? What do I do if this happens? So what knowledge base does is, it's just like you would create blog content or anything today. 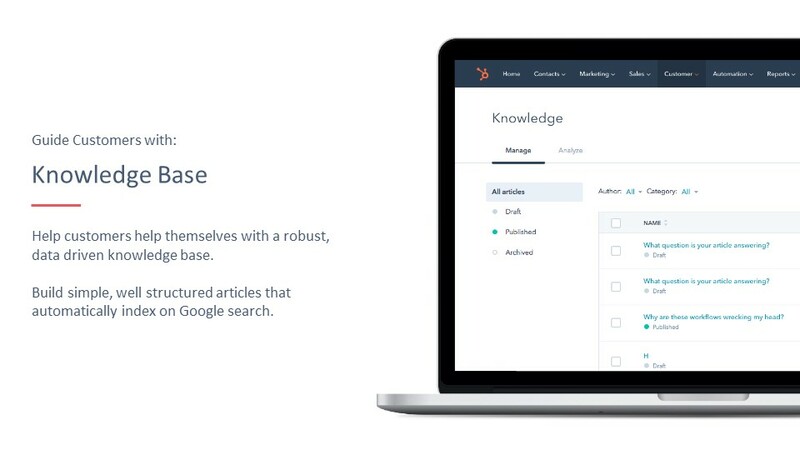 "Knowledge base allows you to create articles of your most frequently asked questions." 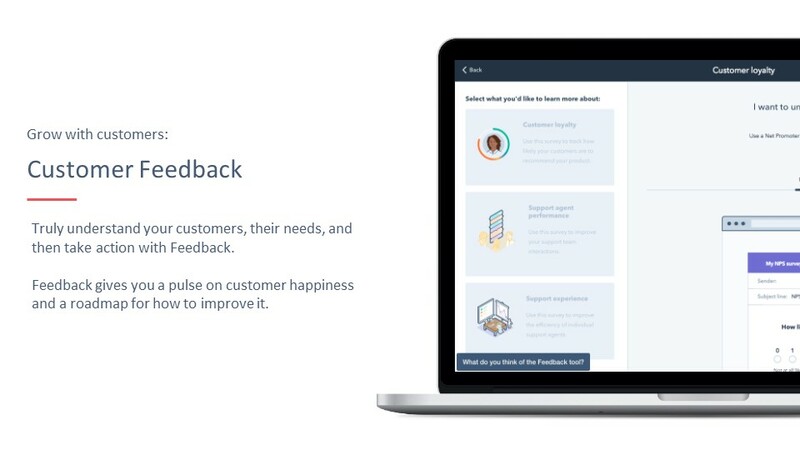 You write them and you rank them and when someone searches for that issue they hit this page and they've got their answer, best customer experience, that's what that actually generates. The great thing that I have found with knowledge base is this evolves over time, so if you were to sit down today and go, what are the 10 most frequently asked questions that my business has, you'd probably be able to list them out really, really quickly. Then over time, whether it's yourself that's sitting with your prospects or your sales team or whoever it is, they're coming to you with real issues. We're getting this question all the time. Let's make an article around it. We're getting this all the time. Let's build three or four different things around it, to make sure that it actually solves for it and that is a really nice customer experience. 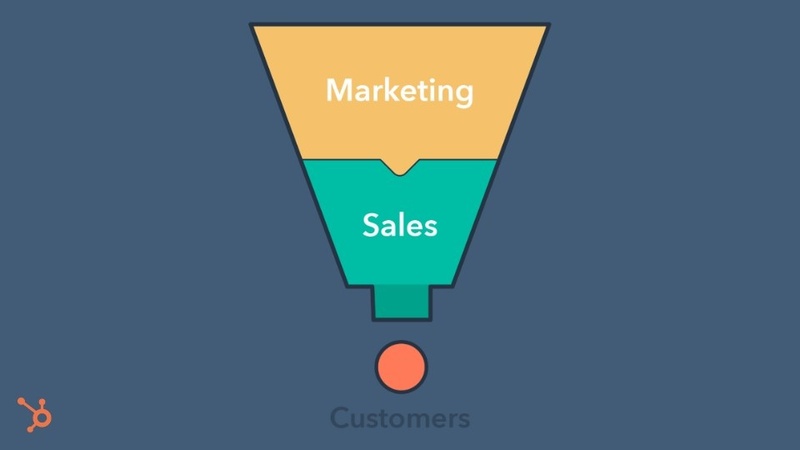 Our knowledge base articles in HubSpot , the traffic to them is absolutely crazy and it's such a better experience than them having to get on the phone or pop an e-mail or even get into chat, to start waiting for someone to reply to them and so on, so forth. It is a very, very important thing that you do for your business and again, we can manage that within the service hub too. 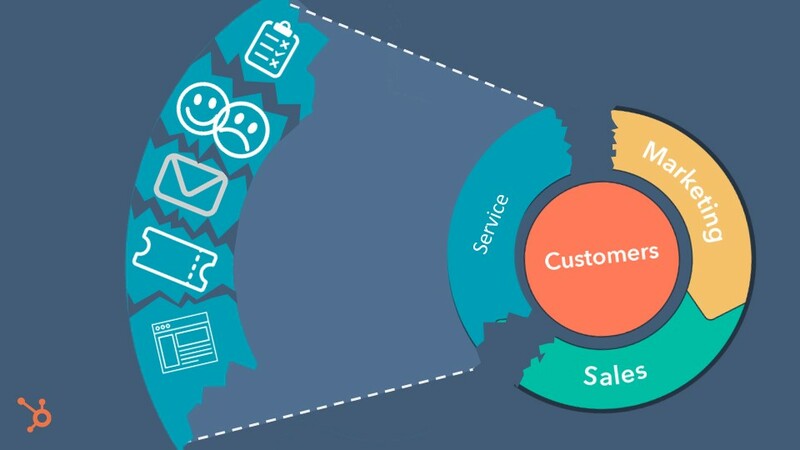 This is probably the most powerful tool ,in my opinion, is the customer feedback piece, so when we give someone an experience of our business, whether it's a customer or whether it's a prospect, it's very important that we understand what was that experience actually like for them and are we moving the right track. Is it actually nice to buy from us? Like has everyone in this room ever experienced difficulty in trying to buy something off somebody, to the point where you just ended up not buying it because they made it too hard? Ensure, that that's not happening. Number one, let's start up there of what we think we should do. Ensure that their user experience, whether it's dealing with your salespeople, or dealing with somebody in the office from a servicing perspective. Make sure that we know whether that's good or bad and we very, very simply just pop up a little MPS and say, "how was your experience? Good, bad, indifferent" to get them to leave a little comment or whatever they want. And what we want to understand over time is what people think of changes we've made to product, for instance, whether that's you know, a physical product that we've had, that we've put out into the marketplace, whether it's a change to the user interface of our software or whatever it is that we're putting out to the market. Find out what people actually really think and what I actually really like about this is that it gives you absolute certainty and that's a very difficult thing to get, particularly in the marketing world, is that it gives you absolute certainty that the decisions you're making are either right or they're wrong and you can actually build an entire MPS strategy around how you want to understand what customers think about what ever it is that you want. That will begin to shape the growth of your business over time, because you're not sitting there blindly making decisions going, "okay, we're going to run 100 miles an hour for two years with this thing and we're not going to ask anybody and then we're going to figure out, maybe it does or it doesn't work". 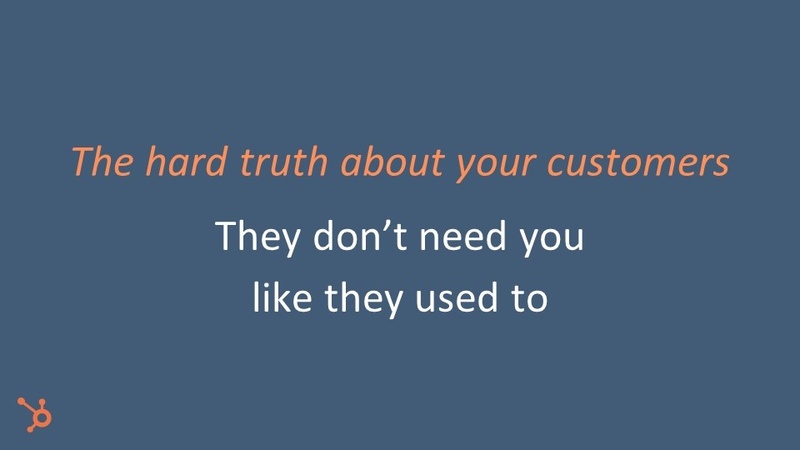 We scale things up over time and we use customer feedback with real data to say they absolutely love this, but they absolutely hate the sales guy who's selling it to them. We have to know those sorts of things, if we want our businesses to work and these very simple pieces of technology can change the way that you deal with that servicing part and as I said, I genuinely mean it. If I was going back to a marketing role today and I was thinking about my strategy, the first place I'd start is in there with those customers and thinking about how we service them because why would I be trying to push new people into a bad situation? 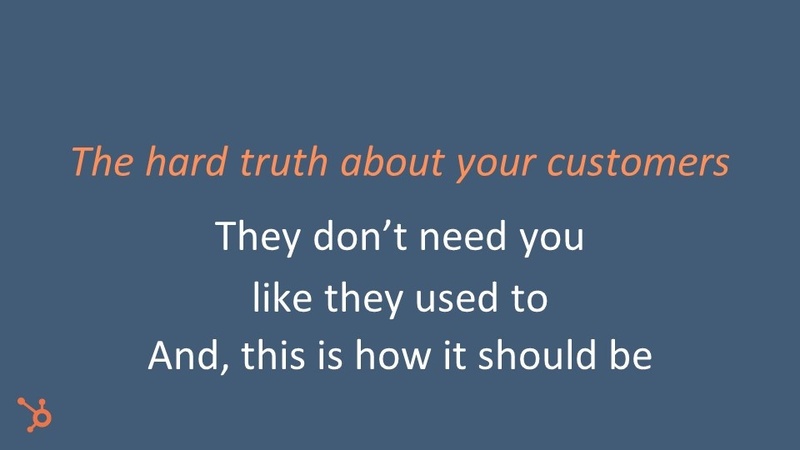 Okay, so they said the reality of this is that the higher truth is that, look, the customers they don't need you like they used to, so you need to begin to, as you hear this all the time, from HubSpot, you must begin to solve for your customers in the way that they do. Your business is not the exception to the rule and that's what a lot of the time when we have these conversations with people, they think they are such a unique snowflake, that we are the exception to the rule. This applies to every business guys. 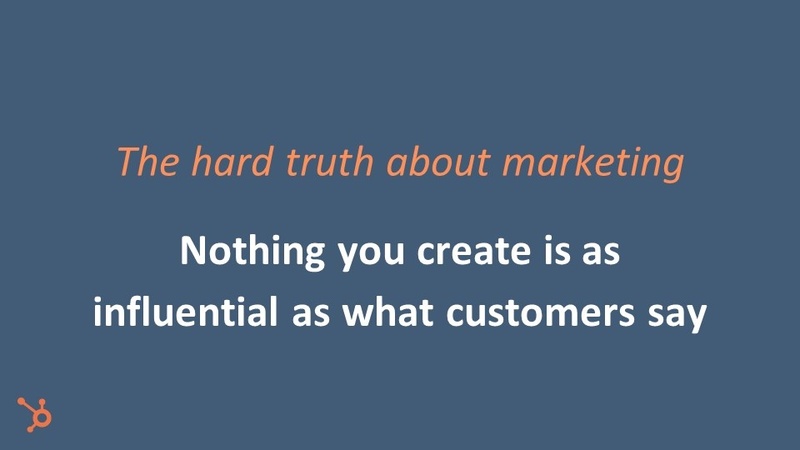 You have to make it easier for your customers to do with it. You have to make it easier for the people who want to buy from you to do with you. So when you're thinking about what you should do here, think about, I always say think about the bad experiences that you've had and ensure that nobody ever has that with you. So little call to action for you guys then. Set up a demo of this and have a look and see what you think ,when you're looking at these sort of products, it's all about what is unique to you as a business and how this would form around you. People use the different pieces of technology in a different way. There's not like one size fits all when we think about doing this. So that's always what I would recommend. Get an understanding of it ,then speak to somebody, if you're interested, and see is this a fit for us and how could we actually begin to build this into our business? Let us have your feedback on your experience with customer service and support. Fill in the comment section below and share.